At least that’s what a PunchTab study of more than 1,000 U.S. consumers between April 18-21, 2014 seems to indicate. 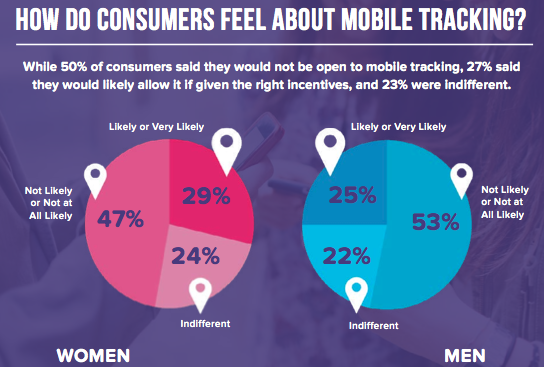 While half consumers were squeamish about mobile tracking by retailers, saying they were not likely or not at all likely to allow it, 27 per cent say they’d allow it given the right incentives and 23 per cent are indifferent. Retailers have recently sought to understand customer movement through their physical stores in more detail with various technologies. With most consumers packing a smartphone that includes a GPS unit, or a Bluetooth chip that can ping nearby beacons, marketers at retail stores are curious about what they can learn from the new steam of real-time data. Companies like Palo Alto, Calif.-based PunchTab, which describes itself as an omni-channel engagement and insights platform, are the sort of vendors that offer to provide solutions to attain that data. Here’s how feelings about consumer tracking breaks down by gender. When expressing why they don’t want to be tracked in stores, 51 per cent of consumers identified reasons relating to personal privacy. Another top reason was concern over excessive marketing, with 13 per cent of consumers worried they’d get “too many messages,” 12 per cent worried the messages would be intrusive, and eight per cent worried they’d be irrelevant. Out of those who said they would allow location tracking by brands, 88 per cent said coupons or special offers were a good reason to do so. The appeal of a shorter checkout time was a good reason to 72 per cent of these shoppers. As to where they’d be OK with tracking, this same segment identified “superstores” that sell a wide variety of groceries and merchandise as the top location (84 per cent) and department stores (78 per cent) and grocery stores (74 per cent) to round out the top three. Retailers will also be interested to know that consumers who initially said they were indifferent or even opposed to tracking will opt-in in some cases, given the right incentives. Twelve per cent of those most opposed to tracking would opt-in for a coupon worth $25 in value, for example. Half that were indifferent about it were more likely to opt-in as the dollar value on the table increased. The takeaway here for marketers? Focus on those who already feel comfortable with online tracking instead of trying to throw money at those not interested. As more consumers opt-in, it may seem more normal to a growing about of shoppers over time.